This little jewel of a basket incorporates a coiled beginning and chain and wheat stitches, all held together with artificial sinew. Explore shaping with the coiled technique to produce the perfect basket to hold your favorite earrings or rings. 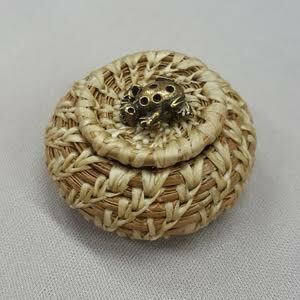 To finish the basket, make a lid that fits perfectly and features a bead of your choice on top. 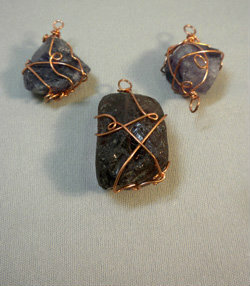 Learn the basics of wrapping stones with wire. Students will practice with copper wire to form a plan for a particular stone, then move to sterling wire for the final project. Registration is through Kirkwood Community College. Register at: www.kirkwood.edu and go to Continuing Education and then search for Beadology Iowa under the instructor search. On-site registrations will be taken if registration through Kirkwood meets minimum requirements of two participants. 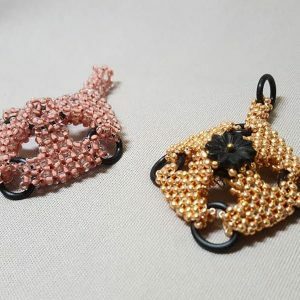 Use your herringbone skills to make a flower that can be used as an earring or a beaded cap for a multistrand project.You will learn to increase to form your flower shape. Prerequisites: Basic CRAW skill--see Intro class earlier in day. Use your CRAW skills to incorporate rubber rings to make this 3-D pendant. Learn to go from CRAW to RAW to make connections to the rings to form this square or diamond pendant. 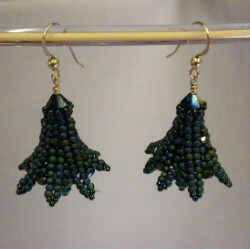 We will use Toho 11/0 beads to make this piece. Note: Take both the CRAW Intro and Pendant class for double rewards points.